Ever since the summer I've been running monthly Dungeon Crawl Classics RPG events with the Norwin Game Knights. While we've had a few "grown ups" at the tables, most of my events have been for the 12 and under crowd. My daughter Carrie has been recruiting some of her friends from school to start showing up, and we even pulled off a short Crawling Under a Broken Moon campaign. 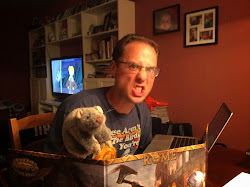 But running games for packs of wild tweens can get a bit rough! So for this month's event I declared that I would be judging for the thirteen and up crowd, and that someone else could take on the tween'sponsibility. Lucky for me that last night I was able to outsource some of the Judging responsibilities... to the next generation of gamers! 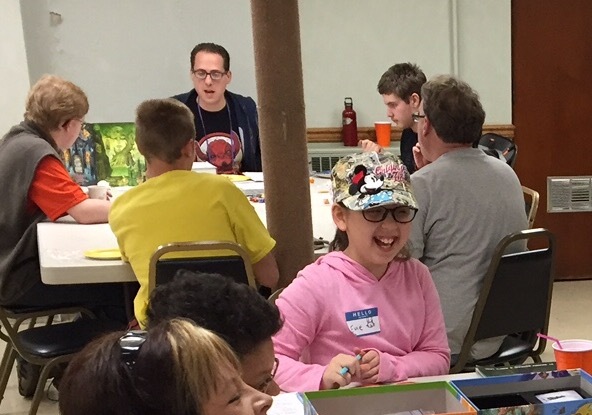 Two of my players from previous games, Evan and Matthew, came prepared to run their own events. This was a special moment for our club, as it was Matthew's first time running an RPG in public, and Evan's first time running an RPG ever! Evan ran Portal Under the Stars, a quintessential quest found in the back of the Dungeon Crawl Classics Role-Playing Game rule book. Even though they technically ran adventures from two separate OSR systems, the similarity of DCCRPG to BFRPG allowed both game masters to use pre-gen 0-level characters from the Purple Sorcerer website. This arrangement worked out wonderfully! There were eleven players looking for games, and between the three of us we were able to keep the table sizes manageable. Evan and Matthew each had three players, and I had five. Father and daughter game mastering! Even my daughter Evie had four players at her No Thank You, Evil RPG session! All in all, counting judges and game masters, there were nineteen RPG'ers playing with the Norwin Game Knights. We've come a long way! +andrew lyon won "best character names" with Billion, Tedford, and Rufus. Sadly Rufus was killed. After most of the party had climbed down the well, led there by Farid the guide, Rambo and Annie (both played by Ryan), declined to climb down. Since she had one of the Tablets of Fate, Annie the Orphan climbed down eventually. While everyone other than Rambo were exploring the area just beneath the well, Rambo decided that Farid had to climb down to be "bait" for some of the cave lurkers. But instead of letting him climb down, Rambo pushed Farid over the edge of the well, hoping that the guide would survive the sixty-foot fall. He didn't. The very next chamber of the room, the "big puzzle" room, shut down the entire quest. Over an hour was spent in this room, as the party battled wave after wave of skeletons after failing each attempt to solve the puzzle. The party did discover that oars (treated as 1d6 damage causing weapons) were the most effective battle-gear to be wielded in combat. We ran out of time just after the group figured out the solution to this adventure. Thank you Michael for finally solving the puzzle! "I wanna be something more than this!" - I asked Michael to have his character (Lennie the Barber) make some kind of epic declaration before leading the party to glory. This is what he came up with. "We're going into the dungeon but we're not taking Rambo with us?" - Craig asked, completely bewildered. "He's rolling '6d10', there's NO WAY there can be a pattern!" - Andy stated to Jeremy, who kept looking for a pattern between the numbers generated by the spinning wheel. While an enjoyable evening, I don't think we had the "A-Team" for complex puzzle solving. Next month I'll make sure to bring an adventure more focused on slaughter, destruction, and war! See you all at our next event on Friday, April 22nd! 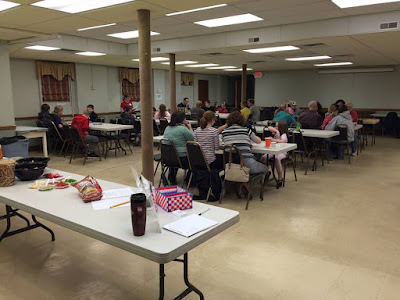 Tuesday's game was ten sessions in the making. Way back in July, when I first started planning for this campaign, I knew that I wanted to run an Ardeyn native game of The Strange. But I was also very excited for my new Cypher System Rulebook's immanent arrival. Our Tuesday night crew had wrapped up a year long Numenera campaign, and I needed to cook up something big and spectacular. ... but what if we didn't start with The Strange? Using the Cypher System Rulebook, I came up with the idea of running an all Ardeyn fantasy campaign outside of The Strange. Perhaps the players would suspect something at some point, but I didn't want to give any significant indications that we would ever travel to Earth or another recursion. There would be no mention of Spinners or Vectors, Translation or Inapposite Gates. All would be revealed at some point, when I'd find a way to get the fantasy characters over to Earth without translating. Just like Beastmaster 2: Through the Portal of Time. But I wanted one more hook, some kind of connection between the two worlds. Frank wasn't sure of what character to create, so we got together and thought up the idea of Gabriella Winter: a college-aged hacker working for The Estate, posing as Sister Sariety on Ardeyn. "Gabbie" was a character Frank returned to from time to time, always in a different campaign setting. Gabriella existed in our Eberron campaign, our Dark Sun 4e campaign, and as "Gabriella the Teenage Lich" in Necessary Evil. Come to think of it, perhaps this has always been the same Gabriella... just traveling recursion to recursion as someone else. 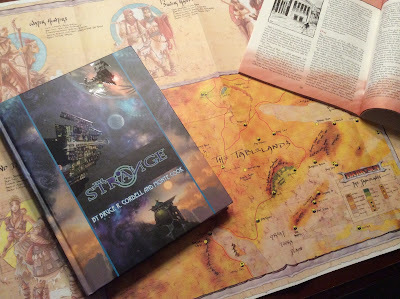 That's the magic of The Strange as a campaign setting... anything is possible! Mwa, ha ha ha ha! "Gabriella!" Agent Calders screamed out just before taking another bullet. "You're too late! Run!" Bullets few across the room, as the party emerged from a massive circular gate-like structure. The entire wall and window assembly in front of everyone was completely torn asunder, with visible claw marks covering the floor and walls. The Focused Inapposite Transfer Device must have worked, Gabriella thought. The Hofmann Institute device was designed to force entities traveling from Ardeyn via Inapposite Gate, to come through this transfer gate. ... everyone except Shenuesh, who was still enslaved by Gabriella's cypher. Wanting to dish out a little pain of their own, Verrenn and Zamani started lashing out with their own powers. The Adept blasted the mercenaries with Arcane Fire while Zamani summoned wind and lightning energy into fearsome bolts. Gabriella called out to the group to follow her, as she retreated back to a nearby elevator door. The entire team followed, with Yaren, shield raised, placing himself between the mercenaries and his fellow adventurers. Once everyone was in the elevator Verrenn looked around. "Why have you brought us nto this small box room!" the Spectral Adept exclaimed. Gabriella Winter had a lot of explaining to do. When the elevator reached the first floor the Charming Spinner guided the team towards an emergency exit. Once outside, the party noticed that several unmarked cars were parked just outside of the office building, but a sizable park awaited just across some train tracks to the north. Careful to be quiet, the fantasy adventurers followed Gabriella into the park, where they almost gave themselves away after bumping into a pair of homeless people. "Oh my God," one of the homeless screamed out. "There's a werewolf, a ghost, and a giant walking cat coming after me!" Fortunately, Verrenn put an end to the woman's yelling with a simple Stasis spell, while Shenuesh knocked the other man out cold. Once at the park, Gabriella tried to calm down the very angry adventurers. She explained that the world they all came from was actually a fantasy world, another land that was very different from Earth. "Which of the moons are we on?" Verrenn asked. Looking up, Gabriella pointed to the Earth's one moon. "We're not on a moon, we're on Earth. That's our moon." Zamani was horrified. "There's only one of them? How can you live like this?" Gabriella asked again that everyone just trust her, and that she would find a way to get them home, but first they had to get to somewhere safe. Crossing the street into a nearby shopping plaza, the Charming Spinner hailed a taxi and convinced the driver that they were a troupe of actors just leaving a play. "Yeah, that's fine. I've seen weirder here in DC," the taxi driver stated matter-of-factly. Once in the taxi, Gabriella asked to be taken to her hotel, the Hampton Inn just south of Old Town. Along the way to the hotel, Verrenn decided to call out everything he saw outside the windows, as he was completely amazed by this futuristic evening. After seeing a Target: "That seems to be an extremely large place to buy bows and arrows." After seeing a Dicks: "No." After seeing a Burger King: "Who is this King of Burger?" After seeing some cars on the Beltway: "How could we all be moving this fast without horses!" After seeing the Washington Monument in the distance: "Surely that must be part of a Qephilim ruin!" "You're probably right," quipped Gabriella. Eventually the taxi pulled up to the Hampton Inn and Gabriella led everyone into the back entrance, using her keycard to open the exterior door, and then the door to her hotel room on the second floor. What played out next was absolute madness! "What is this black frame? Do you worship darkness?" Zamani asked, poking and proding at the television. Once the TV was on, Gabriella turned on Sponge Bob Square Pants for her teammates. Shenuesh, still enslaved, watched calmly while Zamani kept clicking the channels, battling Verrenn for the remote. "This is a magnificent scrying item!" Verrenn kept shouting at the TV. The Spectral Adept eventually got ahold of the remote. "A Magic Wand!" "Dibs!" Zamani yelled at Verrenn, grabbing the remote and accidentally turning on a rather interestinig Pay-Per-View movie. Everyone in the room started staring at the screen when the phone rang. "Hello?" Gabriella asked, picking up the phone. It was the front desk, and they were concerned at the Pay-Per-View usage, as it wasn't approved by Gabriella's employer. The Spinner agreed to go downstairs and handle the problem in person. As Gabriella left the room, she could hear Verrenn yell at Zamani. "Bring back the amusing sponge-form creature," the undead wizard demanded. ... walking in to her room just in time to see Shenuesh (now un-enslaved) trying trying smash her laptop. "Stop! We need that!" Gabriella screamed. Figuring that this was the right time to let everyone in on the big secret, Gabriella had all o the adventurers sit down around her computer screen. The Spinner carefully explained that Ardeyn was another world, much like Earth, but that it existed first as a "computer game." Gabriella was a hacker of some renown, and had managed to acquire one of the few copies of "Ardeyn: Land of the Curse", the same game that Carter Strange used to upload into the Dark Energy Network (a.k.a. "The Strange") just a few years earlier. In her time spent with the alpha version of the MMO, Gabriella learned all about the people and places of Ardeyn. The Estate needed to send an expert to Ardeyn to locate the whereabouts of a potential threat to Earth, a dormant dragon named Rhilan and a set of bracers that could allow creatures to maintain their powers on other recursions. The Hoffman Institute, an allied agency with the Estate, believed that a very rich and politically connected organization on Earth known as the Bradley Cooperative wanted to bring Rhilan to Earth with one of the Baezedaar Bracers. Since the bracers most likely worked like constant inapposite gates, always "on" and always "pinging" potential planetovores in the Strange itself, the threat had to be dealt with. Unfortunately, political pressure from two politicians in Washington shut down the Estate's operation. Something more covert would be needed. In exchange for removing her extensive criminal record, Gabriella Winter would make several trips to Ardeyn via translation and become "Sister Sariety." Once on Ardeyn, she would find native adventurers to go on a quest to destroy Rhilan and his following. Should Rhilan's followers give him a Baezedaar Bracer, and send him back to Earth or any other recursion with all of the powers of Magic, Sister Sariety/Gabriella was to follow, along with her team of magic wielding adventurers. Gabriella showed the travelers from Ardeyn several scenes from their homeland on her computer as she spoke, trying to prove the truth. "My world is probably a video game to someone else, somewhere," Gabriella stated as she tried to offer some empathy. She showed the Citadel Hazurrium, the dungeons below the Queensland, and even gave Zamani proof of the Shadow Realm that the monk had been seeking for so long. Once everyone agreed to to hear more from Gabbie's superiors, the Spinner turned on the news and saw that there were several dragon sightings over Washington DC. She texted Assistant Director Conrad Merrick of the Estate, and agreed to meet up the following morning. It was going to be a long week. The next day, after a long shower, Gabriella went downstairs and retrieved food from the continental buffet for all of her fellow party members. For most of them, this was their first taste of Earth food, including the hot beverage that Gabbie kept referring to as "coffee." "Why does this smell so good, and yet tastes so bad?" Zamani wondered out loud. A little past nine o'clock Director Merrick called Gabbie and stated that a car would be there soon to pick everyone up. They were to meet in Fairfax, Virginia, just west of downtown Washington DC. As the party packed up their gear, Zamani noticed something strange about the device known as a "remote control." The simple piece of Earth technology had changed into an cypher that could bestow arcane armor. Strange. After an hour long drive through weekend traffic, the party arrived at a shopping complex in Fairfax. The Estate office here was an abandoned space located above a Jersey Mike's sandwich store. It was here that they met Conrad Merrick. Conrad elaborated on some of the news that Gabriella had shared. The Bradley Cooperative's well funded plan to bring Rhilan to Earth put everyone at risk, both those of this world, and those on Ardeyn. Should any of the Baezedaar Bracers remain on Earth, a planetovore would surely arrive. Conrad feared that it could already be too late, as agents operating in the Strange itself believed "something" was currently en route to Earth, and could be as few as six or seven days from making contact. Conrad's tone was brisk, and his phrases laden with cursing. "You speak a great deal of excrement," Verrenn remarked to the man. The party seemed mostly against the idea of helping the Estate, as they all (with the exception of Gabriella) believed that they were putting far more into the deal than they would receive. But with Conrad's insistance that Earth's destruction would lead to Ardeyn's, the adventurers reluctantly agreed to continue following Gabriella, so long as they could be returned home. ... probably. Conrad wasn't one-hundred percent sure how yet, but he was working on the problem. They could track Rhilan's path over Washington DC, and see if they could hunt the dragon the old fashioned way. They could visit the politicians working with the Bradley Cooperative, and try to get information through intimidation or more. They could go directly to Deep Creek, Maryland, where the Bradley Cooperative was located. Choosing the third option, the party left Conrad and went with their driver to the van. It was time to visit western Maryland. "His eyes are just taking a smoke break." - Marc after I described one of Zamani's targets having empty, smoking eye-sockets after a wicked attack. "Cool, than I will get a cab." - Frank realizes Gabbie has money. "Yeah, that's a good idea, just leave us standing out front." - Craig wasn't about to let the taxi driver drop everyone off at the front of the Hampton Inn. "Tis the night of the Intrusion!" - Craig commenting at my massive amount of GM Intrusion dropping. "You're lucky my Might pool is at zero or I'd be dropping 3 levels of effort to break the thing." - Jeremy expressing his character's frustration of being so far away from Ardeyn, and how he'd take it out on Gabriella's computer. What's in Your Dice Bag? Role-players and their dice... such a love/hate relationship. Some gamers will spend hundreds of dollars amassing great hoards of dice, only to #DiceShame them all over Twitter and Instagram, with a complete disregard to the polyhedrals' feelings. Other gamers will roll the same twenty-sider over and over again, year after year, until the tiny piece of plastic resembles a near perfect sphere, with the edges worn down to nothing. I saw one of these dice yesterday, when John from my DCC event was tossing around his twenty-sider. It was a small, white die with numbers that were barely legible. Worn, but not tired, the die served his 0-levels well during our journey to the Starless Sea. I'm sure that twenty-sided die has seen many characters come and go, and I would love to hear its full story. Here it is... ain't it awesome? The most special part of this collection is probably the bag itself, as it wasn't purchased. At Gen Con 2014 I met +Shannon Slakinski and her husband +Ray Slakinski at my 10am Saturday game of The Strange. What followed was one of the top five games of my entire life! This adventure was so fantastic and the player chemistry so in sync that we still keep in touch. At some point during the game, Shannon said that she made dice bags, and at Gen Con 2015 she gave me one! The first addition to my OSR bag predates the bag itself! These are my Dungeon Crawl Classics: Shanna's Weird Dice. I bought these at Gen Con 2014 on Thursday, just a month after buying the Dungeon Crawl Classics rulebook. That night the dice were baptized in the blood of player character death during a pickup game of Adventures in the East Mark at the JW Marriott. If you aren't familiar with weird dice, you'll note that there is a D3, D5, D7, D14, D16, D24, and D30 in addition to all the regular faves. At Gen Con 2015 I purchased the Peril on the Purple Planet boxed set. It was one of my first purchases of the convention, and I had been waiting patiently to buy it at the Goodman Games booth on Thursday. Immediately after I realized that I'd need some purple dice to match! These came from Impact Miniatures, and I'd eventually get sets for all the kids in our house. Gen Con 2015 was a bit of a "dice convention" for me. I know I wanted Q-Workshop Dice, because they look so awesome, and each one seems to be intricately carved... even if they are mass produced plastic. These may appear to be Dwarven Rune Dice, but to me they are my Viking dice, purchased as a celebration of my Viking Crawl Classics mini-campaign last summer! Ragnar Lothbrok would be proud! Last month Carrie and I traveled to Michigan for a weekend of gaming to celebrate my good friend +Jeremy Land's birthday. While at Out of the Box Gaming in Grand Rapids I did a little shopping and found these beautiful green dice. After several months of a very successful (and off the wall) monthly DCC campaign using the Crawling Under a Broken Moon setting, and hoping that the Mutant Crawl Classics Kickstarter was approaching, I wanted a set of post apocalyptic dice. These plutonium and slime-green dice would work great! When I found out that Bee Coffee Roasters in downtown Indianapolis gave out a "free die" after so many beverage purchases during Gen Con 2015, I made sure to fill up that card. Free dice giveaway is a surefire way to get gamers into the store... although being right across the street from the convention center doesn't hurt! If you are an OSR fan who hasn't heard about Adventures in the East Mark, then shame on you! Better known as La Aventuras en la Marca Del Este, a Spanish OSR game, I fell in love with the purity of this system and the gorgeous artwork back when XD Publishing did an English language translation Even though I don't speak Spanish (yet), I even got my hands on the PDF's for the native Spanish versions of the subsequent boxed sets. Best known OSR secret: Q-Workshop did an Adventures in the East Mark dice set, and it's PERFECT! I managed to grab one up, and I love the look and feel of these bone-colored dice. There's a skull on each die, and as a DCC judge, I love seeing those skulls show up when I roll out in the open! So what's in your dice bag? I'd love to hear some of your own favorite dice stories, or see some pictures of your most treasured possessions. We see so much dice-shaming in the world... let's send out a positive message for these great tools! A few weeks ago I met +Michael Bolam on the DCC Rocks Facebook Page. He was creating a new Facebook group for DCC'ing in the Pittsburgh area, so naturally I joined. When I saw that the next event was at Phantom of the Attic, a friendly local game store in Oakland (the university district of Pittsburgh), I wanted in. I recently joined the Goodman Games Road Crew to run Dungeon Crawl Classics as part of the 2016 World Tour. So I asked Michael if he'd like a second judge to come join him, and he was totally cool with the idea! I've been visiting Phantom of the Attic in Oakland since moving to Pittsburgh in December, 2000. Whenever I get asked about our local FLGS's, this joint is the first I mention. The location is right on Craig Street between the University of Pittsburgh and Carnegie Mellon University. I get nostalgic just thinking about the store! Right when you enter Phantom, you are greeted by a friendly staff, and the awesome gaming glory hits your eyes. There is a hoard of dice on your right, and a crazy-huge expanse of games to your left. Along the side wall is a phenomenal selection of gently used role-playing game books, which is what first led me to Phantom in 2000. Back when I was a broke college gamer, I needed to save as much cash as I could. I could always count on Phantom to have adventures for a gamer on a budget. My budget may be a bit higher than in those old days, but I still had to go through all of the "New Arrivals" in the used bins. After setting up the tables, Michael split up all of the gamers who showed up to play Dungeon Crawl Classics. Using 20-siders, the four lucky players who rolled highest got to come play at my table. I'm always nervous before running an adventure, even with a familiar system, and especially when it's all new players. For our adventure, both Michael and I showed up to run Sailors on the Starless Sea by Harley Stroh. My table included two experienced DCC veterans who've played with Michael before (Gina and John) as well as a pair of newcomers to this wonderful game (Joe and Jon). For a twist, rather than just handing out standard 0-level characters generated by the Purple Sorcerer, I gave each player one character from the Purple Planet generator. Since I've already featured Sailors on the Starless Sea three times on Living 4 Crits (That 70's Game, Disney Crawl Classics, Cypher Crawl Classics), I didn't plan on writing out a full adventure summary for this event. But I still have to share some of the highlights of our fantastic quest! While exploring a coffin-like structure buried beneath a flagstone, Java the Wizard's Apprentice got dragged into a creepy egg by a bunch of... egg-hair... and then fell into the skeleton of a long-dead creature in the coffin. This whole amalgamation of grossness would become a cocoon. This was the first time running Sailors on the Starless Sea where the characters entered the frozen ice room with the great hide armor and battleaxe made of meteoric iron. I ended up making the room 50' across, which I now realize is far too big, but the players overcame this challenge by curling. They used Griffle the Halfling as a curling stone, and just tossed him into the room. Later, in the Frozen room (let it go! ), the party realized that no one was quite strong enough to lift the axe. Figuring that he was the strongest, Micah grabbed the handle, and started communicating with the axe. The axe informed Micah that he could be made stronger, to which the ditch digger agreed. I gave Micah two more points of Strength (bringing him to a 16), but subtracted a d6 from both his Personality and Luck. But he was uber buff afterwards! Another first for me was the inclusion of Sezrekan's Ring! This magic item is located beneath the pool in the mosaic room, and is hard to find. In our game, it was terribly unlucky! Rip the Earthling Future Man drowned while diving down the tunnel, but still had the ring clutched in his hands when his body was recovered. Rowan, the next "ringbearer" was dragged overboard by a the Leviathan's tentacle, although Micah gladly cut off his hand so that the party could save the ring. The ring would end up in Francis' hands in the end, leading up to a Spellburn of Epic Proportions! EYEBALLS! I ad libbed this on the fly. Evo the Cheesemaker tried cutting open Java's cocoon, and I decided to hose down Joe's character with some caustic juices. I declared that the three damage he took was transferred to this eyeball that grew into his hand. [Spoiler Alert: I got the idea from an old 80's movie called The Gate. Go watch it when you get a chance.] When Evo later died, I said that the eye took over, and inflated into a great balloon sized eyeball that started dragging around the Evo-body. This became a combat, and Joe played the Evo Eyeball Thing. The finale battle was an amazing masterpiece of creative playing and DCC awesomeness! John and Gina worked out this crazy spellburning moment where Francis burned 18 points of stats to destroy seven of the beastman cultists including the shaman. Then, Francis was able to Patron Bond with the new Java-Skeleton that hatched from the cocoon, who in turn created a storm of bones to kill more beastmen. Finally, in an incredible last stand, Phoenix the Sci-Fi Movie Extra donned her Godzilla Costume, drew her movie prop weapon (a blaster), and rendered the final blow on the burning effigy demon-thing that had come out of the beastman ritual. I'm really looking forward to returning to Phantom of the Attic as part of the DCCRPG World Tour 2016! Stay tuned, as we're already looking for dates in April! 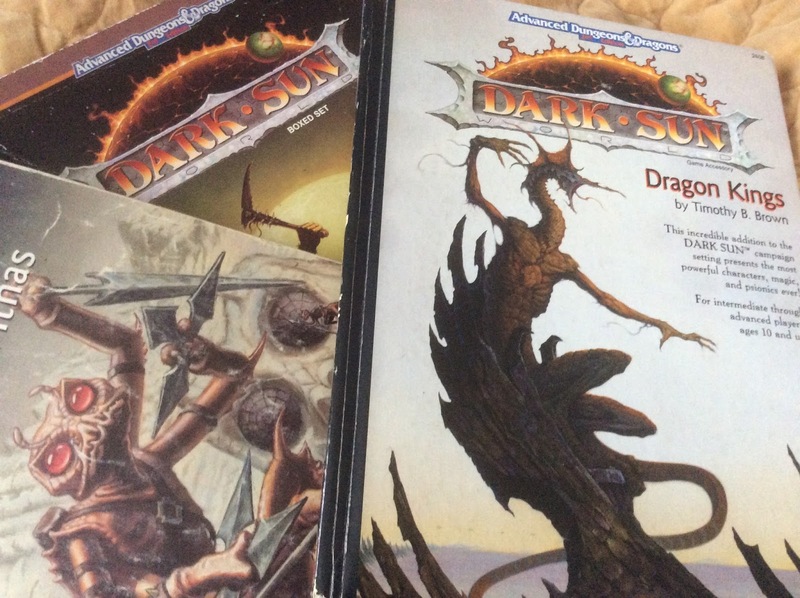 I fell in love with the Dark Sun Campaign Setting in September 1994. I was spending the weekend at my friend Andy's house, and he had this old SSI game on his computer: Dark Sun Shattered Lands. The idea of playing a gladiator-slave desperate to achieve freedom felt so very different from typical fantasy settings. I put in a few hours on the game while staying with Andy, and asked to borrow the game before heading home. ... can you imagine that it was only $20 for the setting? 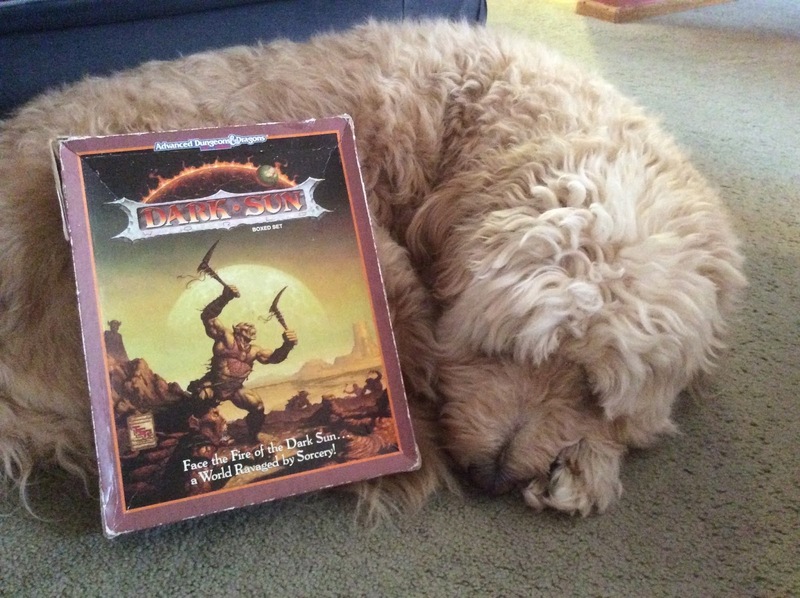 I explored the Dark Sun setting with AD&D 2nd Edition all throughout high school and college. My players threw off their chains and ventured out into the Great Alluvial Sand Wastes. Since one of our player characters was a Templar, we spent countless sessions involved in the bitter disputes between Gulg and Nibenay. Later on our Trader led the party on grand caravan ventures to Urik, Raam, and Draj. Athas truly became our sandbox. Years later I returned to the wastes with D&D 3rd Edition. At the time I was a convert to the new D&D system, and had no interest in playing the game with the older ruleset. Fortunately, I discovered Athas.org! Like thousands of other Dark Sun fans, I found the fan-made rules perfect for running another excursion across the sands. That campaign would last three terrific years, and wrapped up in 2007. 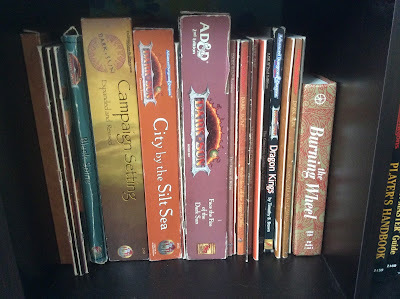 Since then, I've had only a few brief trips back to the Dark Sun Campaign Setting. I ran a short D&D 4th Edition mini-campaign in 2011, but found the drastic changes to the source material off-putting. I'm sorry, Wizards of the Coast, but Thri-Kreen have elongated abdomens, and Half-Giants are quite different from Goliaths. My most recent trip to Dark Sun was when I used Athas a recursion for The Strange last year. We came up with a few basic rules for the recursion, and used Foci to match our agents of The Estate to familiar race and class combinations. It worked really well, and left me wanting more. Before we move forward, I want to be clear about what I've thrown together. I'm not one for full conversions. Sure I could come up with a dozen custom descriptors, and another half-dozen new foci, but why bother? Want to play a Mul Gladiator? A Tough Warrior who Fights With Panache fits quite nicely! Those Gith raiders are Level 2(6) creatures, level 3 speed defense due to their springing ability. It really doesn't take much to Cypher this stuff... that's why I'm such a fan. Obviously you'll need the Cypher System Rulebook. Pretty much a given. You can get the Dark Sun Boxed Set PDF on DrivethruRPG for $9.99. You'll need this unless you've already got a copy. Speaking of, I may need to go get one. The rules for Wild Talents are based on mutations that can come from either the Numenera or The Strange rulebooks. I've got an alternative method as well... we'll get to that soon enough. For this post I'll be covering character generation and some basic rules for general gameplay. I may do another post with some creature conversions, but I trust most of you reading this can do these on the fly. Actually, if you come up with any conversion materials, or comments on what I'm sharing, I'd love to see them! Any character race from the original Dark Sun boxed set can easily be emulated using the right combination of descriptors, types, foci, or even just flavor text. The Cypher System Rulebook goes as far as to point players towards using stock descriptors to describe an elf or dwarf. Not every dwarf needs to be rugged, nor does every halfling have to be stealthy. It's your game, and your character. So when you read my suggested descriptors and some decent foci, don't get bogged down with these being "required" in your game. Even the Half-Giant and Thri-Kreen, each of which I've created slightly customized descriptors, could be created using alternatives. When we played Dark Sun using The Strange our Thri-Kreen was a Lucky Paradox who Hunts with Great Skill. These suggestions probably work best with players who are unfamiliar with the Dark Sun setting. Any die-hard Dark Sun fan will tell you that this isn't the world where you'll find a Jovial Elf or a Kind Halfling! Skill: Trained in all actions involving breaking inanimate objects. Skill: Trained in all actions involving lifting or carrying objects at great lengths. Inability: The Half-Giant's constantly shifting alignment causes cracks in their personality. The difficulty of all Intellect Defense actions are increased by one step. You served as a caravan guard during one of the other PC's trips across the wastes. You are an ex-slave who served in an elite unit hired by another PC's friend's or family. You are paranoid that your fellow PC's will come to distrust you based on your shifting alignment. One of the PC's has been able to help sooth your transition from one alignment to another. You see all of the PC's as part of your clutch. You consider only one of the PC's as part of your clutch, and have a distrust of the others. One of the PC's has watched you consume an elven friend of theirs. You have spent time teaching one of the other PC's how to use your Thri-Kreen weapons, and the experience has been very rewarding. To create the feel of traditional character classes from the original AD&D 2nd Edition Dark Sun campaign setting, you'll need to consider combinations of Type, Flavor, and Focus. Warrior, Speaker, Adept, or Explorer... the "Type" is the core of a Cypher System character. But if you are looking to emulate the "feel" of the original AD&D 2nd Edition Dark Sun, don't get too hung up on this aspect of the character. Your Druid may be a powerful Adept with a deep connection to a guarded land, or an Explorer with a nature-related focus. A Templar could be an Adept or a Speaker, and a Gladiator a Warrior or an Explorer. If you are a game master reading this post, looking to run Dark Sun as a campaign, work with your players. 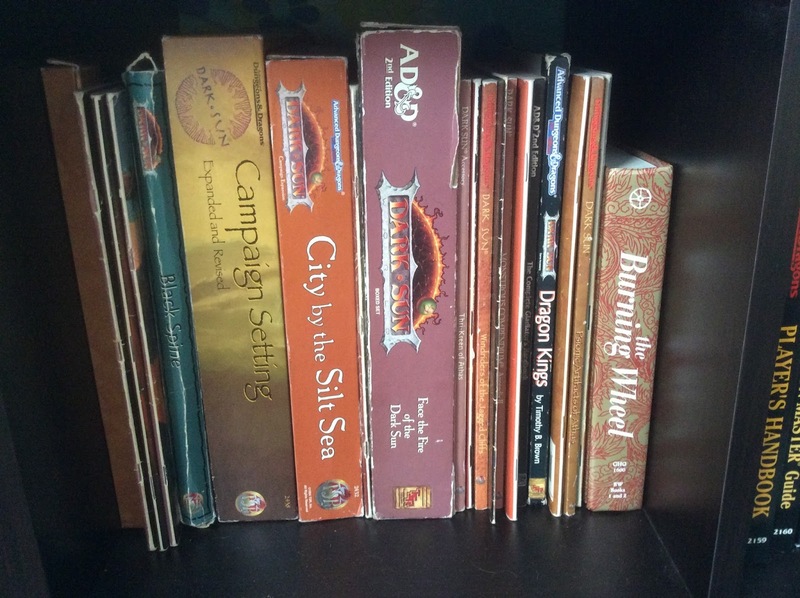 Decide amongst yourselves how closely you want to link the player characters to the original builds allowed in the Dark Sun Campaign Setting Boxed Set. They're your sands. Combat, Stealth, and Magic fit best. What I've done is pulled out all of the traditional AD&D 2nd Edition classes found in Dark Sun, and suggested the best Foci to come up with the right builds. You'll note that I suggest the Types and Flavors for each, but this is another place where you can have fun! If you remember, back in the original Dark Sun there was a lot of multi-classing. When I played Shattered Sands, my party included a Psionicist/Thief, a Ranger/Preserver, and a Fighter/Cleric. In a Cypher System game, my Dwarven Fighter/Cleric could be a Strong-Willed Warrior who Channels the Elements. 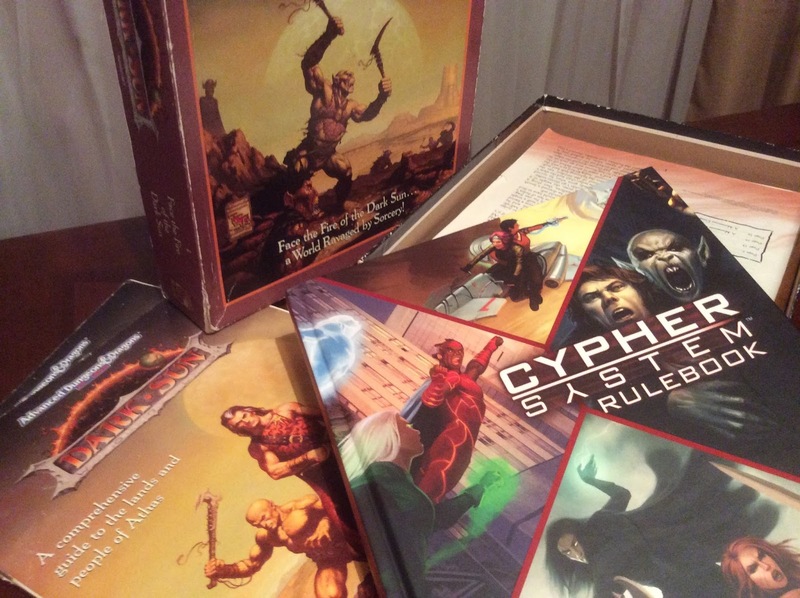 I certainly like the sound of the Cypher build more than the old AD&D title. Blessing of the Gods (Elements): Must choose Earth/Stone, Sky/Air, Sun/Light/Fire, or Water/The Sea. Cannot choose two elemental blessings. Blessing of the Gods: Must choose from Authority/Law/Peace, Knowledge/Wisdom, Protection/Silence, Trickery/Greed/Commerce, or War. Psionics permeate all of Athas, and so every character, when upon completing translation, gain a Wild Talent, a single random psionic ability. To generate this random ability, use the rules for Powerful Mutations, found on page 241 of The Strange core book. Each player gets one roll, and is given a psionic-skinned version of that power. For each character in play, roll one random cypher. This will be their Wild Talent. Once used, the character can roll another cypher after a 10 hour rest. Sure, this isn't the most canonical version of how cyphers work, but its a way to enjoy Wild Talents in your campaign without having to buy anything other than the Cypher System Rulebook. Potion fruit, scrolls, arcane trinkets, pretty much the same as the regular Cypher System Fantasy fare. When using a magical revision, or focus ability, should the player character choose to "defile", the difficulty is lowered by 1 step. When using a magical revision, or focus ability, should the player character choose to "preserve", the difficulty is increased by 1 step. Due to the relative scarcity of metal, most weapons and tools are made of bone, stone, or wood. When using one of these items as a weapon, any roll of a 2 when using an inferior weapon means that the item breaks, and cannot be used until repaired. If the player rolls a 1, not only do they suffer the GM Intrusion, the weapon also breaks permanently. Tools are often made of non-metal as well. Non-metal tools cannot be used as assets, but merely give the user a +2 modifier to the result of the roll. This applies to any encounters that may occur in the open wastes. Traveling across the sands of Athas is very dangerous, and should always be treated as an arduous ordeal worthy of careful consideration. Similar to Horror Mode found in the Cypher System Rulebook, Survival Mode increases the Intrusion Range. ... yeah, it's that dangerous! Accompanying or employing a guide trained (1 step) or specialized (2 steps) in survival. This can include a party ranger or scout. Being part of a caravan. Carrying adequate food and water. So walking from Tyr to Altaruk with adequate food and water grants an Intrusion Range of 3, while journeying as part of a caravan with a guide reduces this to 1. There is safety in numbers, my friends. So that's my take on character creation and basic rules for running Cypher System campaigns on Athas. I may do another post covering monsters, but I think this is enough to get you started. If you have any other suggestions or rule tweaks let me know! I'd be happy to make some modifications and give you credit!